Employing artistic means ranging from video and performance to storytelling and improvisation, the workshop invites its participants to play with language(s). Because language can do and be a lot: Body, landscape, hideout, connection, game, mask, border, gift, weapon, home… SOMETHING SECRET, SOMETHING COMMON, SOMETHING MEAN. The workshop is held by the artists Qwigo L. Baldwin, Ferdi Thajib and Tali Tiller and takes place in two parts at MÄDEA, intercultural Centre for girls and young women. The workshop is aimed at you girls* and women* aged between 12-27. If you would like to attend, please register to maedea@stiftung-spi.de. Space is limited. The workshop will be held in German and English. 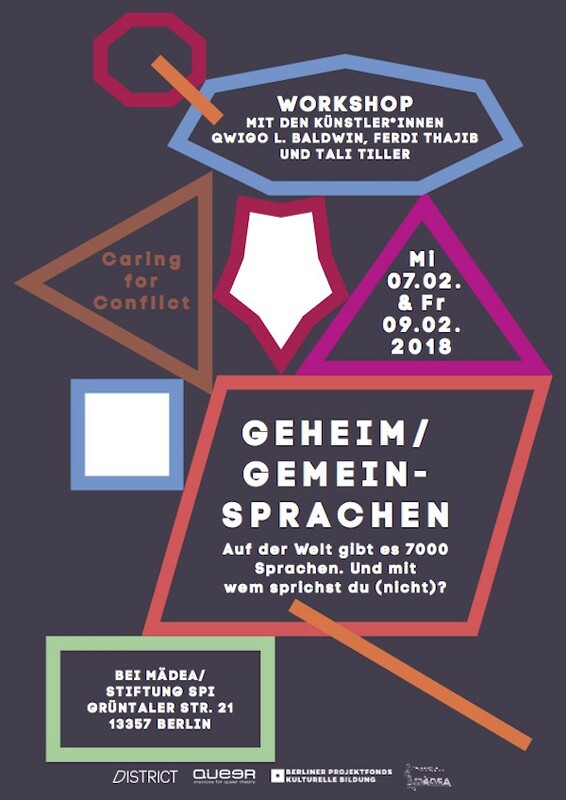 GEHEIM/GEMEINsprachen is a part of Caring for Conflict, a project of cultural education. A cooperation between Institut für Queer Theory (iQt) and the project space District Berlin, kindly funded by Projektfonds Kulturelle Bildung.